When I of speak of direction, I'm speaking about our perception relative to the earth. We all intuitively know about all three directions. For instance, if we throw a ball, it is moving constantly forward, and simultaneously moves up and then down, but never left or right. What I need however, is a technical term for all three directions. To add some context, I are studying the auditory system, and I need a shorthand term for each direction. Unfortunately, it seems that length/width are used interchangeably, with only height being used consistently. I want to work with the terms horizontal/vertical, but there's no term I can find to describe the z axis. Furthermore, from what I've read, many people define the horizontal direction as being the horizontal and vertical direction, with height being described as the vertical direction i.e, horizontal = area, vertical = height. The thing is though is that everyone knows what left and right, backwards and forwards, and up and down are, everyone, and this I believe is because these directions relate to our own perception (rather than an objects). So right now as far as my nomenclature, it's a huge mess. It would be so nice if there is a single word that describes each of these three directions without ambiguity. Consider using Transversal or Sagittal. As you pointed out it is hard to describe such a concept because the position you want to describe is extra-relatal from the observer unlike common directional words we use. North and South are close but they are not usually imagined from the first person point of view are are un-conviently pointed to a fixed spot on the horizon in this case. Since you mentioned a third term to coalesce with horizontal and vertical the answer will be a bit subjective because the way the distances and movement between points can be described are similar in both the sagittal and transverse planes. 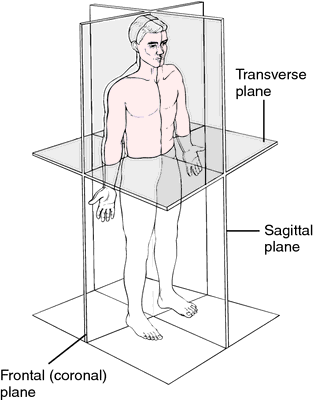 What you are describing is comparing two points along the intersection of the horizontal and vertical planes or more likely between the sagittal and transverse planes. transverse plane of space, n an imaginary plane that cuts the body in two, separating the superior half from the inferior half, and that lies at a right angle from the body's vertical axis. A longitudinal plane that divides the body of a bilaterally symmetrical animal into right and left sections. Because of this it is still necessary to describe the relative position between the points. You can use biological or aeronautical terms to describe forward and backward through the transverse plane: dorsal/posterior or aft for back and ventral/anterior and fore for forward. After reading some of the other answers it seems clear to me that you are stuck with either a frame of reference to the earth or from the point of view of self. Perhaps the answer here is to abandon the term vertical and horizontal and use for coronal, sagittal, and transversal although that still does not solve your earth point of view in which case you can use latitude, longitude, and altitude. But keep in mind it's all relative. Pick a system and stay consistent. There are standards for this, precisely because it is a basically arbitrary decision, and it's very hard to compare published works if everyone uses their own system. You want the body fixed coordinate system for the ear's perspective of the world, and the NED earth coordinate system for the fixed reference frame. Be glad you aren't trying to land a probe on an asteroid via multiple slingshot maneuvers. Those poor sods have dozens of coordinate systems to keep track of. Body doesn't mean human body, it means anything like an airplane free to move about. In airplanes, it is yaw, pitch and roll describing motion around each axis. Not a pilot myself, but I believe it is positive/negative degrees from the neutral standard. X, Y, Z — horizontal, vertical and …? Words for north/south and east/west dimensions? What is a word to accompany horizontal and vertical? What is the technical name for quotes? What's the difference between “to and fro” and “back and forth”? How to distinguish between right (as in right and wrong) and right (as in left-right)? Is there a different word than“back and forth”? What is the technical term for an infinite sentence? What are some less ambiguous words for “choice,” “decision,” “option,” etc. ?